Acrylic Nail History~Some early pitfalls. This may seem like a blog post written quite late for the changing landscape of nail services and nail technology. I do, however, believe that it is something that needs to be keep in the forefront of the beauty industry. Even if it is only quietly sitting behind all the new and wonderful technology. When I first trained to be a nail technician in 1989, the use of MMA (Methyl Methacrylate) in liquid monomer for acrylic nails had already been prohibited for use in the nail industry since the late 70’s. While I was in school the largest concern was that we were using product that did not contain MMA. There wasn’t much discussion, or concern about the primers that we were using on clients natural nails to allow good acrylic nail adhesion. Most companies used a acid base primer and it worked amazingly well! Which it would of course! It was etching the natural nail plate and making it so it would accept almost any type of liquid monomer/powder formulation. When acrylic nails first became “the trend”, there were two distinct problems that came to the forefront. The first was MMA in the liquid monomer and the second was the use of the acid base primers. In the very early early days of artificial acrylic nails, a nail technician would file off most of the customers natural nail (#1 mistake), then they would apply between 1 and 5 coats of acid based primer (#2 mistake). Then they would sculpt acrylic nails using liquid that contained MMA (#3 mistake). As stated earlier, the primer would etch the nail plate. Making it more porous which would allow the acrylic to bond TIGHTLY to it. MMA liquid has a very small molecular structure and would bond deeply and tightly to the acid etched natural nail plate. So hard in fact that they hardly ever broke….But if there was a situation where the acrylic nail was put in a hard spot, like accidentally jammed into a table or caught in a cupboard, the first thing that would break would be the completely compromised natural nail. And since the natural nail was so weakened, it could be damaged quite deeply. There is a web site that shows a very badly damage nail with MMA liquid acrylic nail on it. If you feel you can stomach nail gore, you can visit it at http://www.acrylicenhancements.com/MMA.html. Again be warned that it is VERY graphic. It also has some clues to be on the look out for regarding MMA being used in salons. I’m not sure if you have every snapped off a nail (either natural or artificial) but they hurt like heck and it can take awhile to heal. 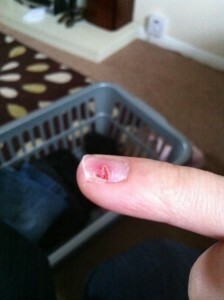 You have to be very careful when you have a nail break deep in the nail bed. This is a open wound that can get infected quite easily. Just think of all the work our hands do in one day. And all the places they get into! It is imperative that if you have a deep break like this that you keep it clean and dry until it heals completely. My best advice is to shorten the nail (being careful to keep your clients discomfort at a minimum), clean it well with antiseptic and allow it to heal completely before re-applying any type of enhancement. It is a professional nail technicians duty to work only on healthy intact nails and skin….but hey, you all know that. The advancement of low acid, no acid primers, and primer-less acrylic systems have made these mistakes easily avoidable. 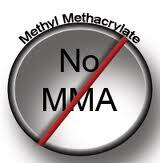 As well as the ban on MMA liquid monomers. In today’s time, there is no reason to use harsh chemicals to have beautiful nails! Although, unfortunately, some unscrupulous nail salons still do. But that is another blog post for sure. A quick hint. If there is a very acidic odor in the salon that you are interested in, go ahead and ask them what they use. And while your at it, ask them what their sanitization practices are. Any reputable salon will quite happily tell you what they use for both of these things. I would be happy to help make this clearer for you and the safety of your nails and health. Great article. Going to the right nail salon will make for a great experience for sure. If you are in this business for the long haul it pays to do it correctly and insure the safety of your clients. That’s what keeps clients loyal and coming back. Thanks for the share.